Tonight I’m blessed to share fellowship with two of my most favorite people, Bishop Guide and translator Todor Yotov, join me to share update on the soon coming hopefully May release of the English translations of the ancient Thracian Chronicles. In 2006, Dr. Stephen Guide and his brother Bishop Tsevatan, released a four-part series called The Thracian Script Decoded I-IV. These books shared the story of how they were able to successfully decode the most ancient pictographic language in the world. Predating the Sumerian and ancient Egyptians by 2000 years, the Thracian peoples were believers in Christ and had forecasted in their writings revelation that He as the Son of God would be born of a virgin of the tribe of Judah and as the Passover lamb that He would be crucified, die, and resurrected in order to redeem the fall of humanity. 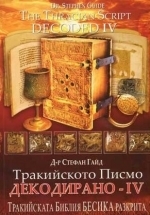 This knowledge verifies that the biblical narrative was not plagiarized from the pagan Samarian traditions but in fact that the reverse is true, and the pagan traditions were actually stolen and counterfeited from the ancient Thracian Christian traditions.